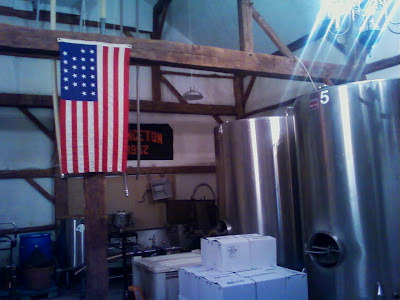 Furnace Brook Winery is located at Hilltop Orchards, a 100 year-old farm set on 200 bucolic acres in the Berkshires. It is a family owned farm. It's tastingroom is rustic and inviting. You can relax inside near the fireplace with a glass of wine, hot cider and/or snacks. 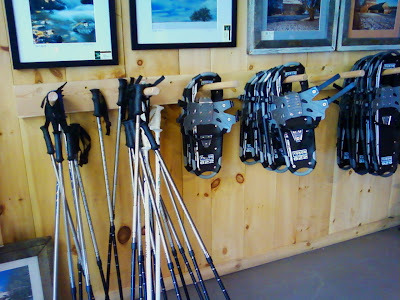 You can also venture out to cross country ski or snowshoe on our groomed trails through the orchard and pristine back country during winter. This is easily the most unique tastingroom in all of New England. When we arrived on Saturday, the tasting room was a buzz with activity. People were busy at the pie and baked goods counter. 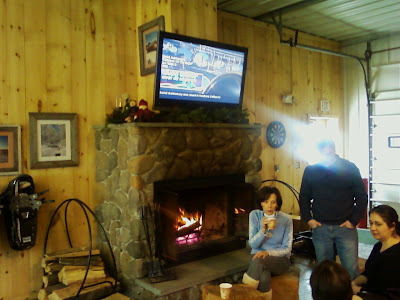 There were a half dozen people at the tasting bar (more than a dozen by the time I left 40 minutes later), and another good half-dozen people watching television, sitting in front of the fire, drinking wine and eating cheese. 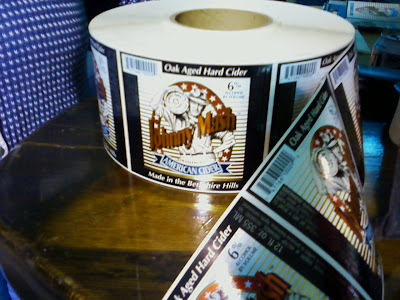 John Vittori, the owner, and his wife, Julie, have always produced one of the best ciders in all New England, Johnny Mash. It's a great cider, filled with fresh apples, just a touch of sweetness, and nice acidity. And after this weekend's tasting, that opinion did not change. In fact, I think they've enhanced their reputation. 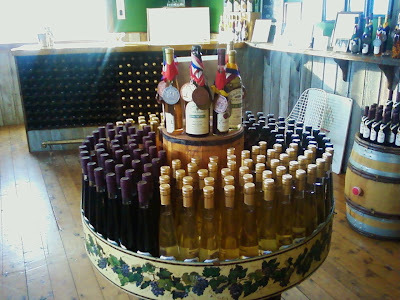 In all the winery makes fourteen wines (including two ciders), ranging from bright whites to smooth, clean reds. 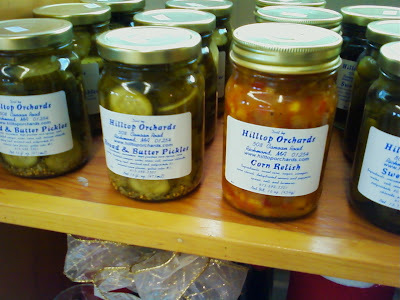 Their wines are made from select Northeast varietal grapes and their ciders from their own apples which are grown right there at Hilltop Orchards. The first three wines were stunners! The JOhannisberg Riesling, the Dry Riesling, and the mead were all great! The Johannisberg was slightly sweet, but still had a slight twitch of sour apple at the end to pull you through. The dry Riesling was a light,, bright fabulous fruity wine, with nice aromatics, that finished clean and bright and dry. A wonderful, subtle dry Riesling. The last of the whites was the mead. Light, bright, with just a hint of honey and yeast to the nose, but a light, fresh, delicate white wine with just a hint of sweetness at the end. 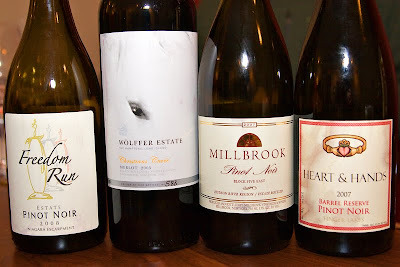 These were some of the best white wines I've had from Massachusetts. They had two nice, light bodied reds available when I went for my tasting - Cabernet Sauvignon Special Reserve, and the Merlot Special Reserve. Both were light-to-medium-bodied. Both had a very nice light-garnet color. They were very much like young claret. Both were fruity up front, with only a small amount of tannin, and a nice, clean, smooth, dry finish. Very drinkable! And then we went to the bubbly stuff. The first was the Sparkling Muscato. This was a semi-sweet, crisp bubbly. Light and refreshing. A great celebration wine. Very, very nice! A lively surprise. And of course there were the ciders. The first was the French Cidre Special Reserve. It dry to slightly off-dry. Very much an attempt to be like a real champagne styled, French styled cider. They largely succeeded. And the final product is an elegant French cider great with food, for sipping from a pint glass, but this is refined enough it would taste best served chilled in a champagne flute. And then there's Johnny Mash. Still a great quaffing cider. Bright, crisp, clean, and refreshing. Down straight from the bottle with your favorite game time snacks, bbq, or perfect with steamed clams. 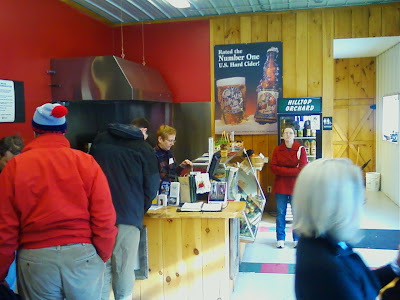 Furnace Brook Winery at Hilltop Orchards is a great experience, winter, sprint, summer or fall. So I had to travel on business and it took me to New Mexico. I flew into Albuquerque and then drove to Santa Fe. On the way I had to stop off in a local grocery store, where I also happened to find several bottles of local wines. I figured I'd take a taste of both, and if I could offer it to friends, while on the trip, all the better. You know me, I couldn't help myself. First was Gruet, which is a very well known winery. 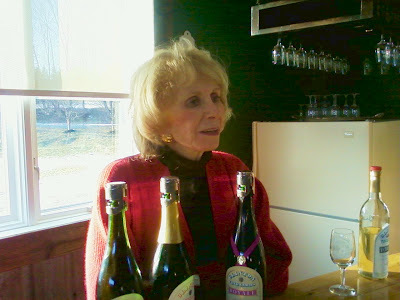 Gilbert Gruet founder of Gruet Winery was born in Bethon, France in 1931. 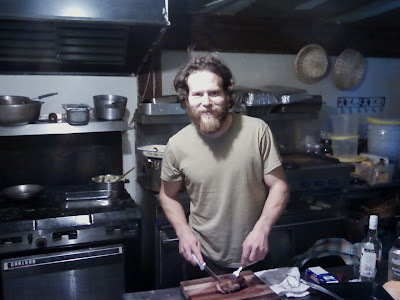 He grew up in a poor family, and began working at a young age. In 1952, Gilbert Gruet, along with his wife Danielle, dreamt of producing fine quality Champagne. Gilbert followed his heart and in 1967 created the U.V.C.B. (Union Vinicole des Coteaux de Bethon), a co-op in the village of Bethon. In 1983, the Gruet family was traveling through the Southwestern part of the United States, and while in New Mexico met a group of European winemakers who had successfully planted vineyards In Engle, near the town of Truth or Consequence, 170 miles south of Albuquerque. The land was inexpensive and the opportunity golden. In 1984, Gilbert Gruet, whose Champagne house, Gruet et Fils had produced fine Champagne in Bethon, France, since 1952, made the decision to plant an experimental vineyard, exclusively planted to Pinot Noir and Chardonnay grapes. His children, winemaker Laurent and daughter Nathalie, and family friend Farid Himeur then relocated to the great state of New Mexico to begin their American wine making adventure. Gruet is one of the most widely distributed wines not made in California, Oregon, Washington or New York. You are likely to find it in any number of wine shops on the east coat. I tried the Gruet Rose. It has a lovely, bright floral bouquet with hints of strawberry, raspberry, and cherry. It was bright and sparkling and lovely. A very nicely balanced wine. Blue Teal Vineyards was founded by the Lescombes family. They have been making wine for six generations. In 1981 the first vineyard was planted, which originally consisted of 11 different varietals on 10 acres in the Pyramid Valley, just east of Lordsburg, New Mexico. The vineyard neighbored a large pond that welcomed migratory Blue-winged Teals during the winter. The Blue-winged Teals became the vineyards mascot and later namesake. With the migration patterns of the teals reflecting the Lescombes own migration to the United States the name Blue Teal Vineyards was created. The hot dry desert days, cool nights and sandy soil created the perfect micro climate for the vineyard. Blue Teal celebrated its first bottling in January of 1984. 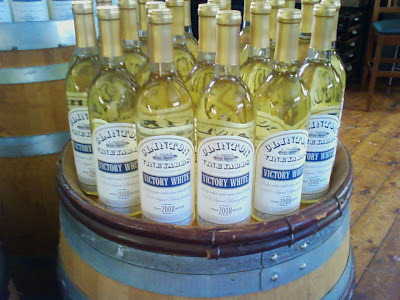 Over the years our winery and vineyards have expanded to bottle over 10 thousand cases a year. 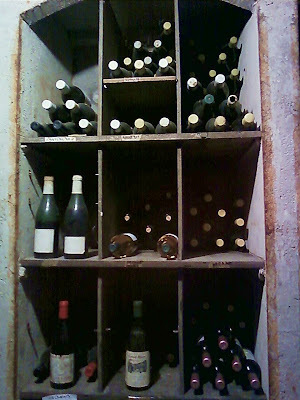 They offer a large selection of award-winning wines. The Blue Teal 2008 Shiraz is a brightly colored red dry wine. There's lots of dark berry up front. And it ends with a lot of pepper. Nice smooth finish. It's a whole lotta wine for an inexpensive $9.00 bottle. Very nice. Anyway, 6 hours of plane rides there, and six hours back. It was an exhausting trip. But I had fun. It's the winter months and it's a great time to catch up with winemakers, with many closed, and hibernating for January, February, and March. 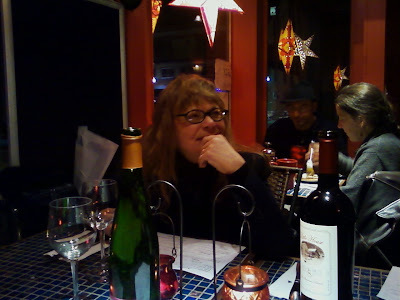 Dominique was smart enough to schedule a dinner with Paula and Fred of Cereghino Smith Winery, at Fez, a Moroccan-Mediterranean restaurant in Saugerties, New York. Fred was dashing as he opened up two bottles of wine. We enjoyed a fresh, bright Gewurztraminer first with our appetizers. We had a mez plate, which was a small tasting dish of seven items, fresh, fried falafal with sauce, and white bean with chirizo soup. All three were absolutely fantastic. We then moved onto dinner. 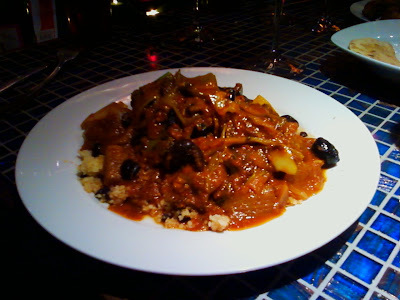 Dominique had a fabulous spicy Moroccan tagine vegetarian dish, Paula had a tagine chicken dish, Fred had fish, and I had a short rib stew with polenta and fresh broiled snow peas. With all of this we had Fred and Paula's Little House 2007. This deep, rich, red wine is 50% Syrah, 25% Mourvedre, 25% Petite Sirah. It's aged for 14 months in hybrid American/Canadian Oak barrels. With this Rhone style blend, Fred and Paula celebrate the Quadricentennial of the Hudson Valley and the Huguenot families who first brought vinifera grapes to this country. Fred and Paula are defintely Hudson Valley garagistas. And Imean that in the highest possible way. They make about 500 to 600 cases a year, of the richest, deepest, darkest reds in the valley. 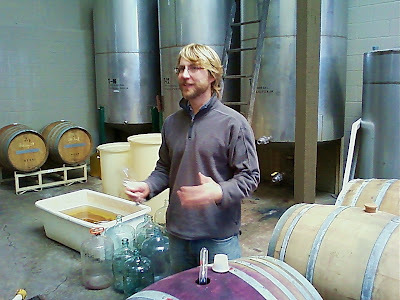 We talked about barrels, and stainless steel tanks, about wine festivals, and bottling machines. We all could have talked for a very long time. The Fred and Paula's wine was excellent. A treasure. This is a new bottling. A new vintage. Tremendous. After a long legal struggle, Paradise Springs Winery in the Fairfax County town of Clifton opens for business. With its grapes lightly dusted with snow and the wine cellar wrapped in a red bow, Fairfax's first and only modern winery opened last week after a contentious legal struggle that involved the county, the state alcohol board and Virginia's increasingly powerful wine industry. Paradise Springs Winery, tucked inside a 37-acre forest in Clifton, a small horse community in a corner of southern Fairfax, has come into existence after an odd mix of legal maneuvering and political drama. Owners Jane Kincheloe Wiles and her son Kirk, 27, wanted to pay off $750,000 in inheritance taxes on their historic farm and initially considered selling the land to a residential developer. But investors and winemakers encouraged the family to build the county's first vineyard on a piece of property that was part of a 1716 land grant from Lord Fairfax. The Wileses can trace their ancestry in the region back several centuries. "I really didn't want to break the chain," Jane Wiles said. "I just wanted to really give new life to this place." 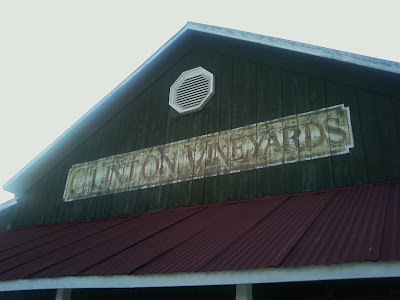 The Wileses said they envisioned a small but high-end winery that would add a new flavor to Clifton's Norman Rockwell-like charm. But more than a year ago, Fairfax County zoning officials denied their request to build the vineyard, arguing that the plan amounted to an industrial use because grapes would be trucked in. Black Walnut Winery is touting the release of two wines for a weekend that also includes a wine and cheese pairing (Saturday, 1 to 5 p.m.) and wine and brunch Sunday (11 a.m. to 1 p.m., seating limited to 40, $24.99; tickets must be purchased by noon Thursday). One is a full-bodied lightly-oaked 2007 Chardonnay that's selling for $19 and a 2008 Pinot Noir that selling for $18. The winery is touting the latter as containing a bright, upfront fruity flavor that's light- to medium-bodied. Aromas of sour cherry, raspberry and a bit of spice. 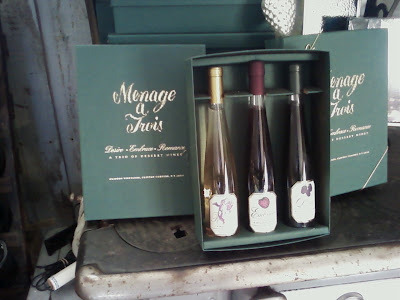 They are discounting both wines 10 percent this weekend only. You'll find Black Walnut in Chester County, Pennsylvania, just off Route 30 east of Gap. 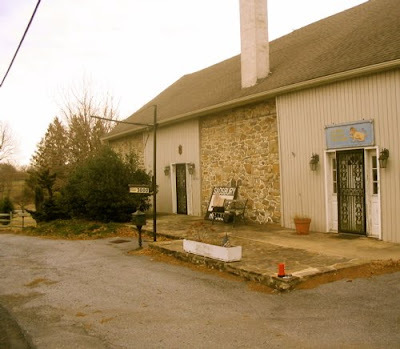 The young winery is a member of the Brandywine Valley Wine Trail and owned and managed by two couples. It all started one day in 2001 when Lance, Valerie, Jack and Karen decided to try their hand at winemaking. Their friends joined in and they processed 500 lbs of grapes for their 'unofficial' first crush under a canopy of Black Walnut trees at the home of Lance and Valerie. This very quickly became an annual event. Several years later, they began to talk about opening a winery. In April of 2006 we began the process of renovating a 198 year old bank barn in Chester County, PA to house Black Walnut Winery. We have done most of the work ourselves on the weekends and vacations from our regular jobs and have enjoyed every moment. Friends and family came out in the fall of 2006 to participate in the first official crush at Black Walnut Winery. Several years later, we're sipping on the fruits of our labor. 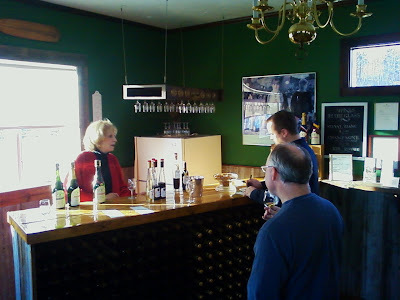 We invite you to visit Black Walnut Winery to sample our wines in our distinctive tasting room. There are several brands of wine that make up the Prince Michel of Virginia product line: Madison, Rapidan River, Prince Michel, Symbius, and most recently, Raccoon Ridge. 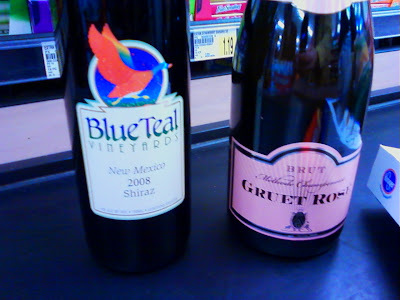 Each is located at a different price point and is targeted at different groups of wine drinkers. 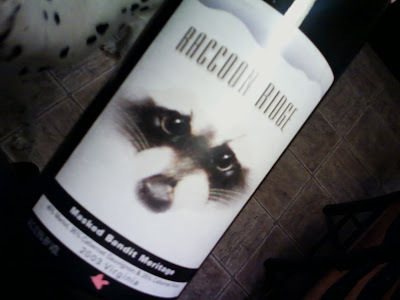 Raccoon Ridge is a brand new wine and Gotham Graphix based the label design around a charming watercolor drawing of “Rocky” Raccoon. An effervescent typeface proclaims the name of the wine while bright bars of color form the frame of the label. At the 2005 American Marketing Association’s Excellence in Marketing Awards, Gotham Graphix received an Emma Award for this label design. When Prince Michel Vineyard and Winery was founded 26 years ago, a vision was formed out of the love of Virginia and its relationship with the vine. 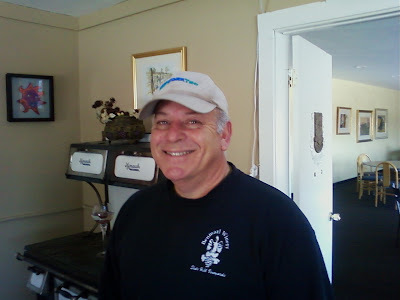 Prince Michel has since grown to become one of the largest, most widely distributed, and recognized wineries in the state and along the east coast. I had not heard of this wine before I found it. But Prince Michel is a very reputable and large producer. This was not an expensive bottle of wine, but the look of the package, and the label were nice. However, I was quite pleased by the wine. Firstly it smelled of vanilla and plums. It was a deep red color, more a Bordeaux or maroon color, than a bright claret style. And on the mouth deep berries and plums came through, and as the wine opened up plum became the over riding aroma. The wine had lots of fruit up front, but finnished smooth and dry. A very, very good wine! 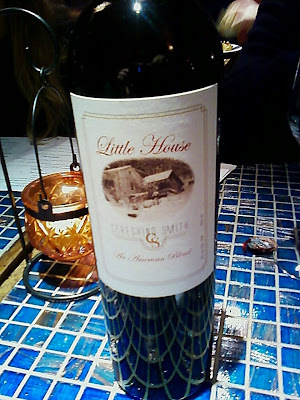 I had this deep red wine with a home made turkey pot pie from Red Barn in upstate New York. The pie was exquisite. Perhaps the wine really should have been paired with steak, roasted meats or vegetables, or a big, spicy pasta dish. But regradless, it was very tasty. Lenn Thompson and his staff of regional editors at the New York Cork Report held a wine competition in the Finger Lakes over the weekend to decide the Best Wines of 2009 in New York state. It was a good and noble and important effort, and I think one of the most well thought out ideas in a long time as to how New York wines are evaluated. I'd love to see this endeavor grow. I think Lenn and his team have the opportunity to grow this competition into something like the movie or tv or theater awards. Maybe not with all the hoopla, but certainly with the build up. 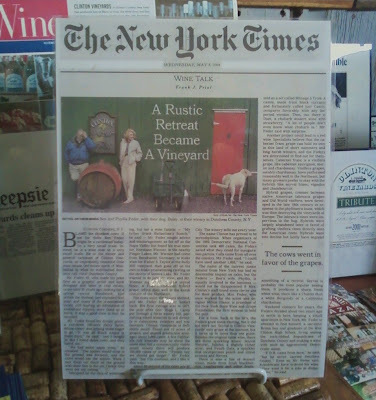 Wineries should help promote it for a month in advance (great tasting room fodder for the folks pouring behind the bar) so that it becomes like the Booker Award in the UK, which helps not only promote the industry, but also helps promote the books, authors, and publishers as well. But I would also like to see it become a paid attendance kind of tasting event for the general public, and covered by all the bloggers, wine writers, etc. 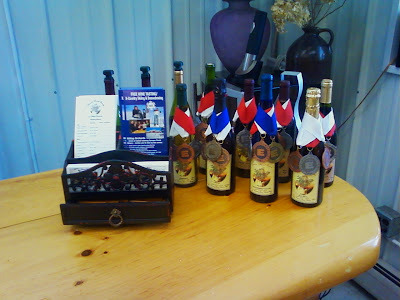 And promoted by the wineries and the bloggers as well. And maybe in the future the staff, which I am sure will grow, might allow a guest judge or two. That would also lend some cache. I would like to see more of that kind of thing as they go forward. However, let's not get too ahead of ourselves. Lenn and his group of intrepid writers deserve heaps and tons of praise. A great job! A great idea! I truly believe they created something special. Horton, it must be said, is still the king of Norton. It seems every year I am lucky enough to try a Horton. And I am rarely disappointed. I love their Viognier. 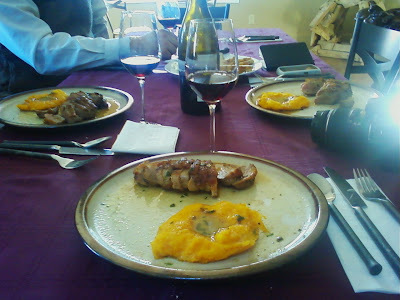 And I love their Touriga Nacional. But they are fmous for replanting and bringing back in a big way Norton. 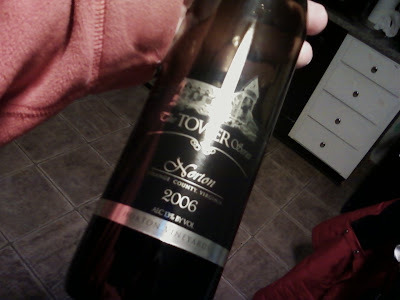 From what I have been able to gather the Tower Series is available only through Total Wine, which is where I got my bottle. Sounds like a special labeling/bottling for a large customer. The vision of Horton Vineyards is to grow grapes ideally suited to the climate of the Old Dominion. This vision has led to the planting of French Rhone, Bordeaux and native Virginia grapes. Horton Vineyards is proud to re-introduce the famous Norton wine, the original Virginia Claret. Norton is a native Virginia grape that produced the internationally prize winning clarets of the Monticello Wine Company of Charlottesville in the late 1800's. Their Norton is of a dark, rich color. It has an intensely fruity aroma - plums and tart cherries come through as promised. Ageing in oak for 14 months has given this wine a long, flavorful, spicy finish. A very nice, and unique wine. 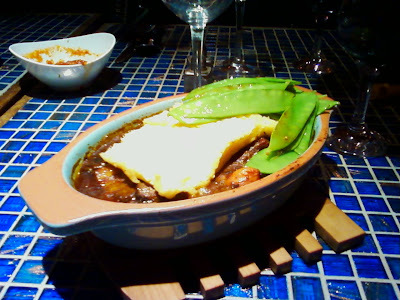 I had mine with a pasta dish of spinach with olive oil and garlic layered over pan fried cheese filled ravioli. It was incredible. A lovely way to end a Tuesday evening. Still worth the effort to find it. Phyllis Feder came down the walk from her Dutchess County Colonial farmhouse to greet us. She was accompanied by a friend, and a small Wheaton-mixed fluffy dog, who attended her every movement. Lithe and elegant, she greeted us warmly and entreated us to come inside. She moved slowly, but gracefully. She was, as usually, beautifully attired. There is no getting around it. You can still feel Ben Feder's presence here. It is after all a very personal place. 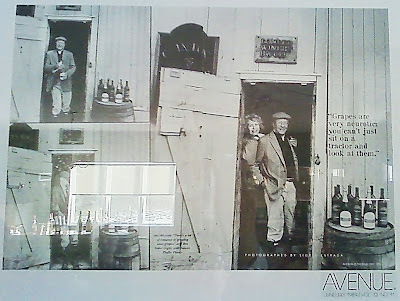 It was the magical place Ben and Phyllis turned into one of the most sought after farm wineries in the Hudson Valley. 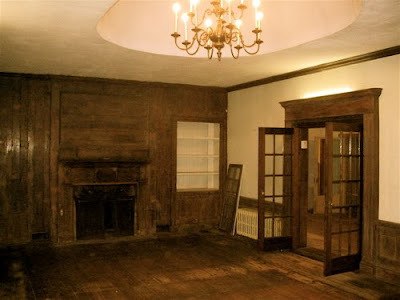 For as much as he was the grand old man of the Valley for the last five or so years, there was a time when Ben and Phyllis's country retreat was a swank oasis for numerous fashionable Manhattanites, especially those in the publishing and design world. The winery has a classic tank room, that just as might be anywhere else. Save the little touches. A Princeton University banner hung on the walls. An American flag hung proudly - one with only 24 stars. These are personal touches. Who ever decorates a tank room? But it's fabulous. Your eye constantly dances around. The tasting room is very much the same way. It is dark green, well lit with windows (one has a spectacular view), and it is handsomely appointed. As was the original intention, the room feels more like you are in Ben and Phyllis's elegant wine den, rather than a shop. There is a large plaid couch, and several chairs. And the walls are plastered everywhere with personal and professional mementos. Photos of Phyllis and Ben from their younger years. Pictures of them with friends, and notables, especially former NY Senator and now U.S. Secretary of State Hilliary Rodham Clinton. The room is warm and friendly on a cold January day. The wines are beautifully displayed, and the bar is very handsome and functional. And the tasting in particular is fun. And Phyllis is chatty and funny. It is a good day. 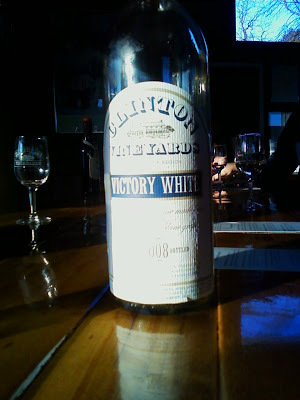 Victory White is this year's bottling of Clinton's famous Seyval Blanc. Seyval Blanc is all they grow at Clinton. 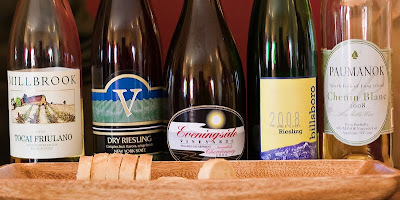 They make four different kinds of sparkling wine with it, and a classic dry white table wine. 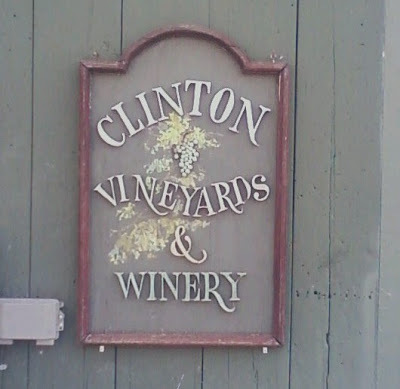 In this respect, Clinton is an old fashioned winery. They make wine with one kind of grape, and they do it very well. I think their Seyval Blanc is one of the best in the Valley. 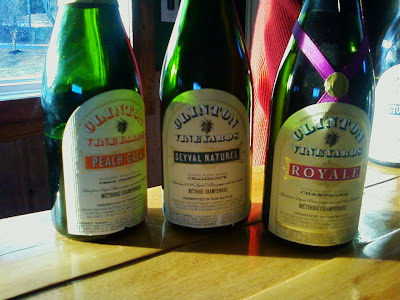 Clinton offers four sparkling wines. These are three. The Seyval Naturel is classic Seyval, as a sparkling wine. With just a hint of sugar, it's a crisp, refreshing sparkling wine, with a touch of sour green apple, almost Riesling-like. Wonderful! Peach Gala is a Seyval based white sparkler, with a touch of peach juice to it. It's got a nose that's incredible. It smells like here are fresh peaches soaking in your glass of sparkling wine. Not incredible sweet, it does have the slightest touch of sugar. Fabulous for brunch or dessert. Royale is an all together different experience. It is a sparkling wine with some Cassis. A wonderful Kir Royale in a bottle. A lovely before- or after-dinner drink. 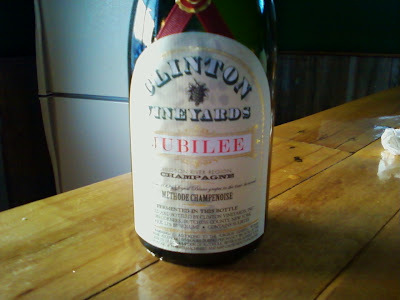 Clinton also makes some wonderful fruit dessert wines. Their Cassis, as was described in one of my previous posts (see East Coast Wineries Cassis Throwdown), is exceptional, and has set the standard in the Valley for some time. They also make an excellent Raspberry and Blackberry dessert wine. They sell all three in a boxed set. A great gift package. 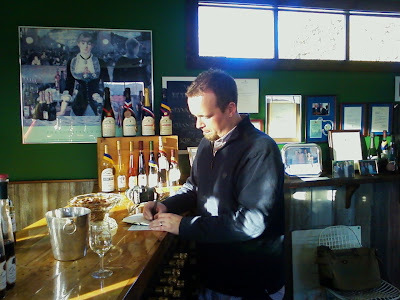 Here's New York Cork Report Editor-in-Chief, Lenn Thompson, taking notes during his tasting. Here's an ad from Avenue magazine that features Ben and Phyllis. Great ad! Ben's presence can still be felt. Phyllis and Ben were both designers. 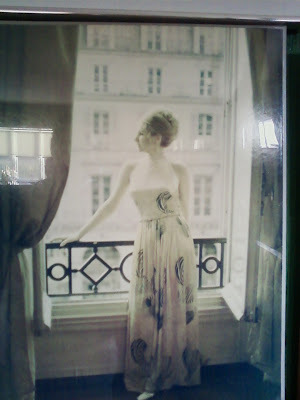 Here's a stunning photo of Phyllis from the 1970s while in Paris for a design competition. Frank J. Prial did a wonderful profile of Ben and Phyllis not that long ago in the New York Times. 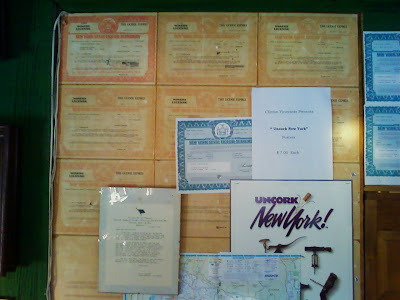 A wall plastered with all their old and present State Liquor Authority winery licences, which have to be renewed each year. This is the Seyval Blanc up close. One of the last surprises was when Lenn Thompson asked what Jubilee was. Phyllis yelped, "Oh, my, I almost forgot!" She readily poured it for us. It was easily a great shocker. Jubilee is a bone dry, Brut styled sparkling wine. I did not think anyone could make as good a tasting champagne-styled wine in the Valley. I am mistaken. This was easily the biggest surprised of our day. Lenn bought two bottles. I bought two bottles. It tasted like fine, French sparkling wine. Tremendous! Really quality stuff. In a blind tasting, I'd defy anyone to discern it from any sparkling in the Champagne region, and tell me it wasn't. We had a great afternoon with Phyllis. A wonderful time. A great experience. 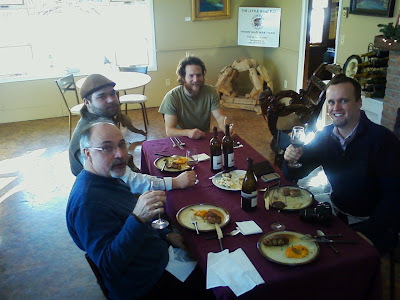 So David Jackson and Lenn Thompson (from the NY Cork Report), Dan Rowland (Clinton Vineyards), and I went to Benmarl to visit Matt Specarelli and Kristop Brown. Matt met us in the courtyard. From there, Kristop took us on a tour of the winery. 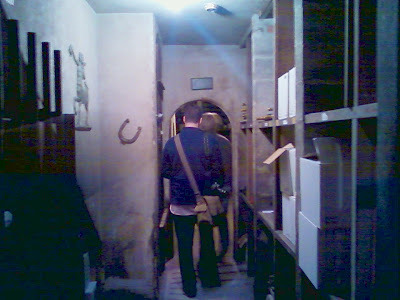 First, we went down to the old cellar of Benmarl. 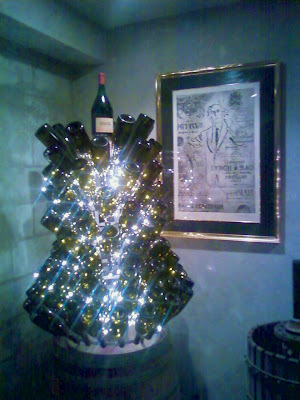 We walked past a Christmas tree made of wine bottles, which was placed near an old print of Mark Miller, Benmarl's founder. 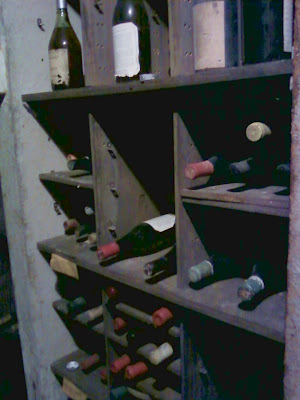 In the old cellar, they keep the old bottles of wine, since Benmarl dates back to the 1950s. A large iron-bar jail-cell type door. That let you into the inner sanctum. Kristop walked us around the winery. We saw dozens of barrels of wine maturing in the wine cellars. 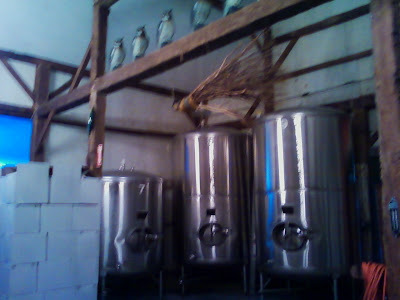 Then he took us to the wine making area, where in two rooms, they had a blend of old tanks and new tanks. And lots of history. Kristop was entertaining, and passionate. Maybe that's why I like Kristop so much - he's so passionate. I think Benmarl is very lucky - they have two young men, who are fired by passion - and are filled with youthful zeal. They are Benmarl's secret weapon. And that is why Benmarl will ultimately be a very successful. They are open to new ideas. And they are passionate about making good wine and growing their business. For the afternoon, Matt then made lunch for us. 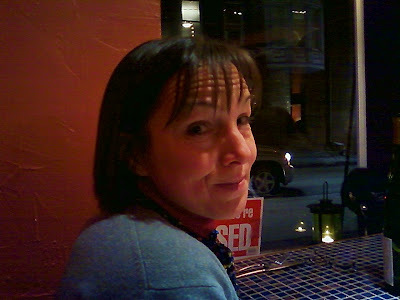 We enjoyed roasted duck, and sweet potato hash browns, as well as a plate of Hudson Valley cheeses and artisanal breads. So, here we were, enjoying our lunch. 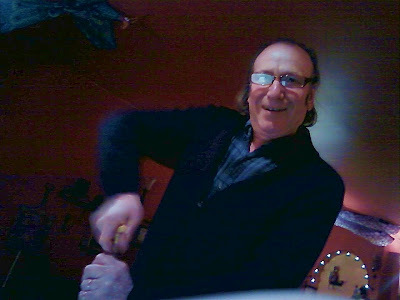 Victor Specarelli was a ubiquitous presence around the winery. 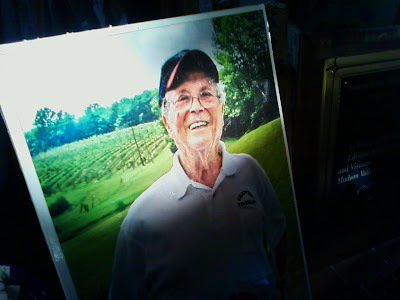 He was giving folks tours, planning weddings, and working the winery. This 1988 Late Harvest Vignoles was brought up from the old cellars. It was incredible. Especially with the Old Chatham Blue Cheese. It was an excellent meal. Really fabulous. New York City quality. And Matt made it! 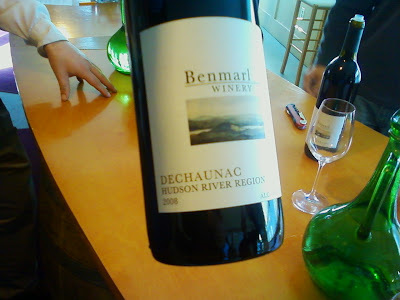 With it, we had a 2005 Benmarl Baco Noir. Exceptional. 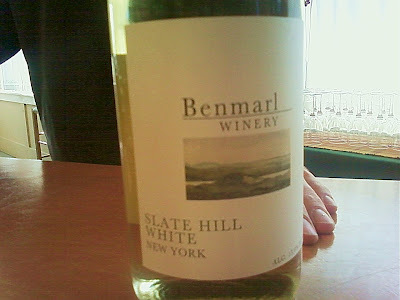 Slate Hill is one of my favorite whites. It's a blend of several different wines, including Vidal, Seyval, and several others. I also think their Riesling I tremendous. Dechaunac is a tricky grape. 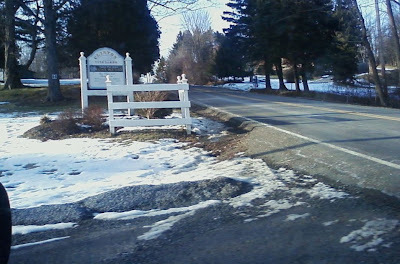 It is planted throughout the Hudson Valley. The Benmarl version is one of the subtlest I have ever had. It had the classic DeChaunac nose, but without the classic sharp cinnamon nose that comes form incorrectly made DeChaunac. It's smooth and drinkable. Approachable. Very nice. A great table wine. Fruity. Dry. Very wonderful drinking wine. We also had a great New York Can Franc. It was big, fruity, with an elegant dry finish. 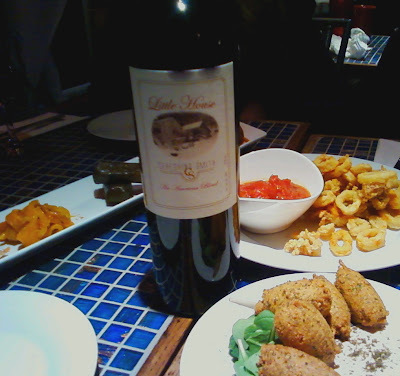 And we also had a wonderful, deep, New York Merlot. 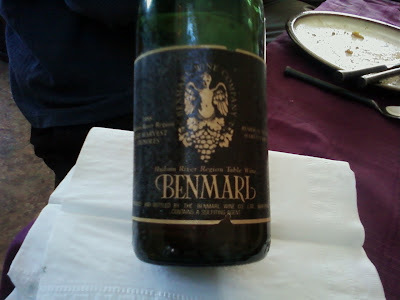 Benmarl is a old winery, that the Specarelli family is reviving. And they are doing a great job. Maybe you won't get the treatment we did. But you can taste and buy some of the same wine we did. And more. Got to Benmarl and meet Matt and Kristop. You'll be thrilled. Brooklyn Brewery Big Bottle Series - Awesome!